First-aid training equips anyone to help people who are injured or physically ill. Which raises the question: Could mental-health first-aid training enable anyone to help people with panic attacks, suicidal thoughts or hallucinations? Ms. Jasinska was one of 14 people who paid $65 to attend a recent eight-hour class in Chicago offered by Mental Health First Aid, a fast-growing program that trains people to identify, understand and respond to others who are in emotional distress—whether on the job, in community spaces, on the streets, or at home. Since its introduction in the U.S. a decade ago, Mental Health First Aid, or MHFA, has trained more than one million people across the country. Since 2014, the Substance Abuse and Mental Health Services Administration, part of the U.S. Department of Health and Human Services, has provided more than $15 million to state and local education agencies to implement MHFA programming. “People understand that mental-health problems are common,” says Myra Rodriguez, who has conducted 30 MHFA courses in Chicago since becoming a certified instructor last year. The program’s impact on mental illness, however, is hard to measure. Bruno Anthony, a professor of child and adolescent psychology at the University of Colorado School of Medicine, published a study on MHFA earlier this year in the American Journal of Health Promotion. While participants showed an almost 30% increase in knowledge about mental-health issues and confidence in offering assistance, there’s scant data on how such interventions benefit the recipients, says Dr. Anthony. “The impact on those who are touched by MHFA trainees is still to be determined,” he says. “Identifying mental illness is not the problem; getting services is,” says DJ Jaffe, who runs Mental Illness Policy Org, a nonprofit that provides policy analysis. As for the MHFA program, “there’s absolutely no evidence on how this affects the very people they’re trying to help,” he says. In a typical MHFA training session, participants role-play various scenarios, following a template for how they should respond called Algee, for the five steps it includes: assess for risk; listen nonjudgmentally; give reassurance and information; encourage professional help when needed; and encourage self-help. 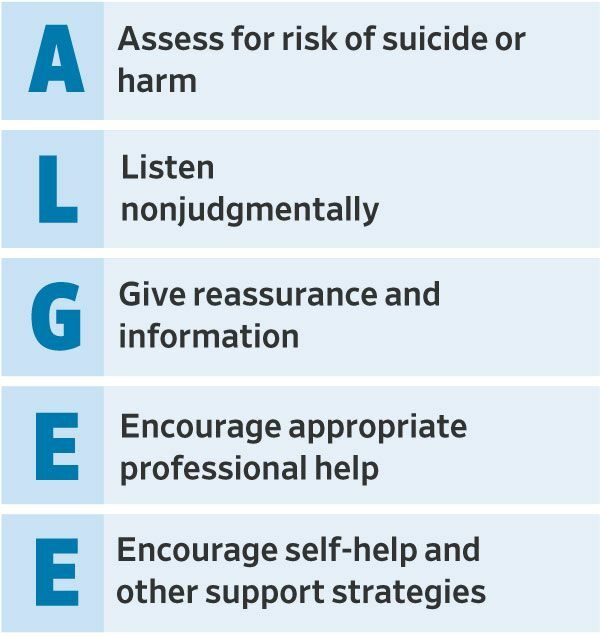 For someone who may be suicidal, first-aiders practice very specific, direct language: “Are you thinking of killing yourself?” “Have you decided how or when?” “Have you collected things to carry out your plan?” If the person answers “yes” to any of these questions, a first-aider will talk in a calm and reassuring manner, not leave the person alone and seek professional help immediately. At the conclusion of the program, trainees leave with phone numbers for referrals. They are reminded to use their skills to de-escalate situations, but to never put themselves at risk. “If you take CPR, you are not trained to be a cardiologist; you are learning how to help someone until they can get professional care,” Ms. Schwartz says. As for liability issues, trainees cannot be held responsible for a bad outcome, similar to Good Samaritan laws for citizens who intervene in a medical emergency, Ms. Rosenberg says. At the University of Chicago, more than 500 staff, faculty and students have taken the MHFA course since 2015, according to Julie Edwards, director of health promotion and wellness at the university. She says the class became a requirement last fall for resident assistants—students who advise dorm residents on virtually everything, from roommate problems to planning dorm activities. The academic environment can be intense, filled with high achievers who hold themselves to rigorous standards, says Hamilton Wilson, who is starting his second year as a resident assistant at the university. A senior majoring in sociology, Mr. Wilson is responsible for 100 students on three dorm floors. He has never dealt with a suicidal student, he says, but the MHFA training has still come in handy—in helping not just students, but also friends and family. “I was able to talk them through what they were feeling,” he says. Ms. Rubin is a writer in Chicago. She can be reached at reports@wsj.com.